Positive Thinking And Using Positive Thoughts - What Really Works? Using positive thinking and positive thoughts can have an incredibly positive effect on your well being when done correctly. And even make you younger! But many people haven't been given the right tools to use this amazing power to its full potential. In fact, sometimes people get "turned off" when someone says, "just think positive" because it's hard to do when you're suffering from depression or anxiety. You feel like you're standing out in a lightning storm with a metal umbrella and someone's saying, "just pretend it's sunny and everything will be alright." Common sense dictates to pull down your "lightning rod" and get out of the rain. But how many of us stay "out there" because we believe that thinking positive "really will" make everything alright. And we just get drenched! 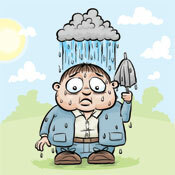 This web site is here to give you effective tools to keep you dry and positive! Your complete resource for tips, techniques and information to keep you thinking positive. I'll cover a wide gamut of techniques and how they work – including how the Law of Attraction fits. From simple affirmations and self hypnosis to subliminal work (so you can even become positive while you sleep – one of my favorites) you'll find something that works for you! Imagine knowing just the right way to use positive thoughts to make your life work! 5... 4... 3... 2... 1! How did you feel the second time? Some people have strong physical sensations when doing this exercise. They feel incredibly lighter, happier or have “tingling” or “moving” sensations as their energy shifts. If you did, great, you're on the right track. But, all you did was shift your thoughts, right? The problem wasn't solved was it? Safely practice positive thinking -- "When to get out of the rain"
Make your positive thoughts "automatic"
Relieve stress "on the spot"
Take control of your life... Oh, I mentioned that already, didn't I? 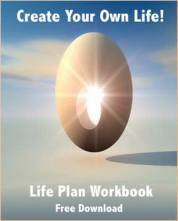 If you're new to positive thinking and personal development and want to know more about the personal development process in general, you can download my free PDF personal development workbook which gives you detailed instructions on how to get started with your new life plan. It also gives you a full personal development template that you can fill in for yourself as you follow my example. Just click here to download the workbook (or right-click for PCs) and the PDF will download instantly. So, I've put together tips for achieving a positive attitude, how to stay positive, affirmations, and other resources for self improvement like establishing a personal development plan and finding a positive thinking career. And if you're thinking this might be “kind of hard.” Relax... It's simple. You just have to re-vamp your “brain trains” (thoughts that are like “run away trains.”) I'll show you how. The more positive “trains of thought” you establish, the more your body “gets it” and actually changes on a cellular level to keep you going more and more in a positive direction. Something about “emotional addictions” as I recall. The best thing of all is that you can use cutting-edge technologies like brainwave entrainment that instantly relieves stress, anxiety and depression, which makes staying positive a breeze! come in "out of the rain" too!